The markets continue to be impacted primarily by trade war fears, as China fires back this week with a list of trade tariffs against US goods after the US announced new tariffs on Tuesday. Both countries have not immediately implemented the tariffs, setting the stage for talks that will likely produce new formal trade agreements. This is the likely eventual outcome of the trade war drama that’s impacted the markets in the last few weeks. The other significant market news this week was the reported increase in trade deficits, now at -$56.7 billion, however, the US has always run trade deficits, so this is not due to any ‘trade war’ impact. More potentially market-moving news was the announcement of the March Challenger Gray Corporate Job Announced Job Cuts/Layoffs was almost double the level in February and the highest in two years. This increase in Job Cuts/Layoffs was led by losses in the Retail/Telecommunications sector. However, the overall numbers for weekly jobless claims are very low. The end of the week brings the release of March’s employment statistics and a speech on the economic outlook by the Federal Reserve Chairman Jerome Powell. The market will focus on employment stats around average earnings and labor participation rates. 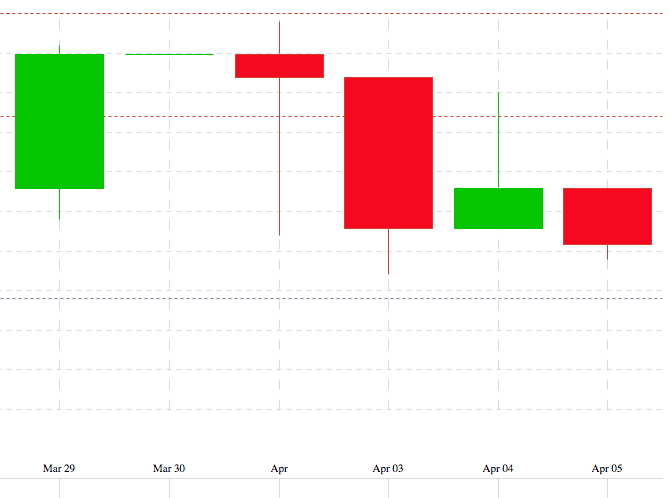 This week’s candlestick chart, below, shows a continual drop in Mortgage Backed Securities (MBS) since the market closed on March 29th, however that translated to a very minor movement in rates. MBS directly impact mortgage rates, and the days with red indicate higher and green lower rates. These rates are all for 80 percent loan-to-value ratio (LTV) loans. 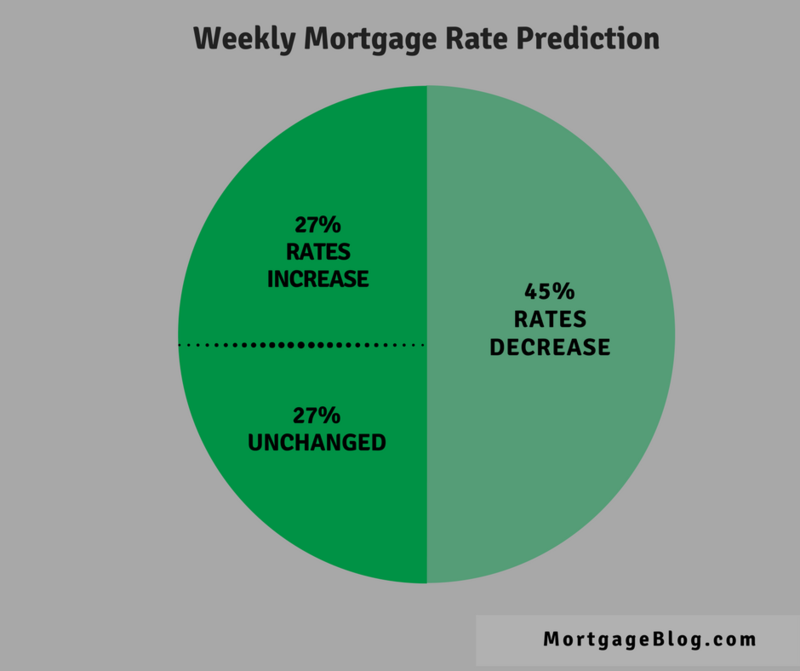 Weekly mortgage rates and trends from Bankrate, a compilation of mortgage and economic experts across the country, shows 27% predict an increase in rates in the coming week; 45% predict rates will fall, and 27% predict that rates will remain relatively unchanged (plus or minus two basis points). If you are scheduled to close within the next 45 days, recommend locking in your rate as no upside to rates looks possible for the foreseeable future. Should the economy continue to improve as trade war fears dissipate, rates could likely increase in the future.